Everyone gets into bird breeding a different way. 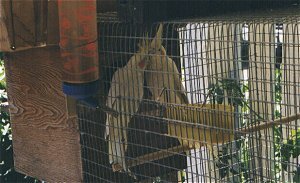 I started out with several pet budgies that I had decided to keep outside. My mother went out and bought a nestbox so they wouldn't get cold at night (that was, of course, the last thing on the birds' minds when they saw it). This simple act was what thrust me into the wonderful world of aviculture. The following article is to help all of you beginners who have no idea where to start. 1) Read as much as you can about the species you're going to breed. 3) Make sure your birds like each other. Some species (particularly the larger ones) can be picky about their mates. Unhappy couples are more likely to have problems. 5) The cage should be very roomy. Some birds feel more secure when placed at or above eye level. 6) Buy or make an appropriatly sized nestbox and attach it to the cage (the higher the better). Make sure it's easy to access. Add a layer of pine (NOT cedar) shavings to the bottom. This bedding will need to be changed every so often after the babies arrive as it will get rather soiled. 7) Make sure you know a good breeder and veterinarian to help you with any problems you might encounter. 8) Since you are a beginner, I would advise letting the parents do the work and not trying to raise them yourself. Handfeeding is a difficult and stressful process that requires good experience. 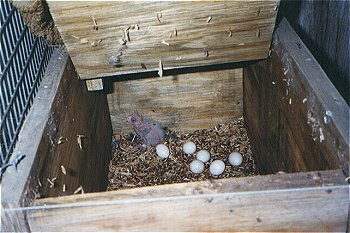 1) Many times a pair's first clutch will be infertile or will contain infertile eggs. 2) If you don't live in a very humid area, it is a good idea to spray the lid (on the inside) of the nestbox with water for a few days before the eggs hatch. 1) Chicks hatch naked, blind, and wrinkled. They may look deformed at first, but they stop looking as strange when they get larger. 3) Make sure the chicks are well attended to and that their crops are full. 1) It's always a good idea to keep a few babies for future breeding stock. 2) You can usually let the more prolific species have three clutches in a row (don't do this if they seem stressed though). After that they will need at least a six month break. Some birds will keep trying to breed until you remove the nestbox. 3) Disinfect the nestbox by emptying it, soaking it in bleach water, and then letting it dry in the sun. 4) If your pair breeds in a smaller cage, you may want them to get back in good health by placing them in a flight during the off season.